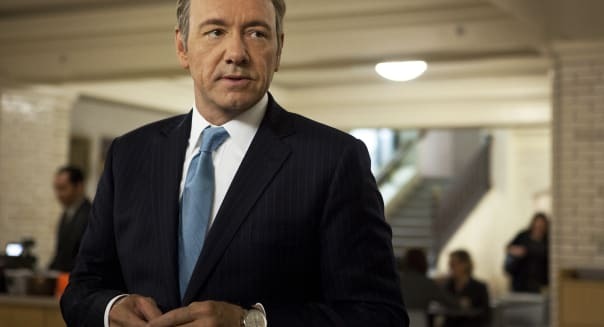 AP/Netflix, Melinda Sue GordonKevin Spacey as U.S. Rep. Frank Underwood in "House of Cards." One of the things that sets Netflix (NFLX) apart is its decision to offer entire seasons of original content at once. When the second season of "House of Cards" becomes available on Valentine's Day, fans of the award-winning political drama will be able to watch the entire season in one sitting if they so choose. Netflix calls it binge viewing, and it's a far cry from the traditional release platform where networks offer episodes in weekly installments with lulls for reruns along the way. Netflix has championed this approach since it broke into the market of offering first-run serialized dramas two years ago with the introduction of "Lilyhammer." At the time it was unconventional, but now that Netflix has followed suit with "House of Cards," "Orange is the New Black" and the "Arrested Development" revival it is something that viewers have come to expect out of the leading video service. Binge viewing is the new normal, but that doesn't mean that catering to it is the right approach. It's been two years since Netflix decided to cater to binge viewers, but its rivals don't seem particularly ready to play along. Amazon.com (AMZN) broke into original programming by letting its users vote on several pilots. The first two shows to make the cut -- "Alpha House" and "Betas" -- made their season debuts in November. As Netflix's closest rival in the streaming business, the market was naturally going to keep an eye on how the leading online retailer would dispense the episodes. Would it follow Netflix or would it give a nod to traditional release schedules? Amazon chose to carve its own path. %VIRTUAL-article-sponsoredlinks%When "Alpha House" and "Betas" debuted, it made the first three episodes of each available immediately. However, the balance of the seasons were dispensed in weekly doses. It seemed as if Netflix was going to retreat from its binge viewing mantra a month later when it rolled out "Turbo FAST." In conjunction with DreamWorks Animation (DWA), this was Netflix's first foray into original programming for children. It only made the first five episodes available at the time, promising to release more in batches along the way. Netflix backed away from suggestions that it was changing its tune. It explained that it merely went with the first five installments because those were what it had ready at the time. Kids also likely have different expectations of binge viewing, since many are happy to watch the same episodes over and over. It's not just Amazon bucking Netflix's trend. When Chipotle Mexican Grill's (CMG) "Farmed and Dangerous" -- a comedy that skewers agri-chemical providers -- is introduced on Hulu later this month, the episodes will be introduced on a weekly basis. Amazon, Hulu, and premium cable channels could've followed Netflix's lead, but they have all chosen to stretch out their original content as much as possible. Netflix is sticking to releasing whole seasons at once, believing that's what customers want. Netflix is serving 2 billion hours of content a month, so there's good reason to trust its judgment. However, the content does tend to lose a lot of the weekly dissection through social media and at the office water cooler when everybody's watching at their own pace. There isn't a lot of in-depth chatter since viewers probably don't want to play spoiler to those that have yet to catch up. It's also hard to build momentum when everybody isn't on the same page. There will never be a "who shot J.R." moment in binge viewing. We may eventually see Netflix cave in to see if it can get more mileage out of rolling a show out slowly, the old school way. Milking the most out of every weekly morsel with its breadth of more than 44 million streaming subscribers worldwide could be something special. We may never see it, but it certainly seems to be what everybody outside of Netflix wants to show us. Motley Fool analyst Rick Munarriz owns shares of Netflix. The Motley Fool recommends Amazon.com, Chipotle Mexican Grill, DreamWorks Animation and Netflix. The Motley Fool owns shares of Amazon.com, Chipotle Mexican Grill and Netflix.